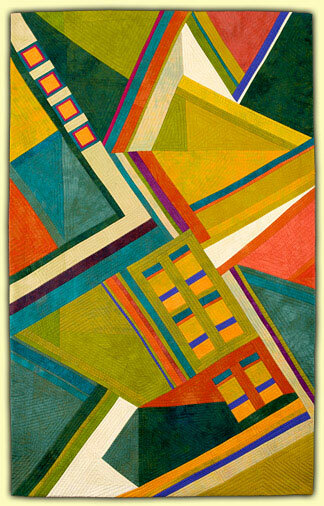 I explore the relationships between lines and shapes and their color while combining and direct piecing fabrics. Color is especially exciting to me. I dye my own cotton fabric, continually searching for better color and texture. It is an ongoing experiment yielding frequent surprises. I am particularly pleased when viewers feel drawn into the work. I machine piece and machine quilt my own pieces. I work intuitively. My designs essentially develop themselves. Meanings and sources generally remain unknown to me. Ellin has shown her work in many of the most respected national and international fiber exhibitions, including the very prestigious Quilt National and Fiberart International. Most recently, she has been invited by Nancy Crow to show her work in Color Improvisations II which will tour a number of venues in Europe throughout 2016-17.